If you’re looking for the best baby bath tub that will keep your child safe and secure during the bathing process, we have you covered. Here, we review six of your best bets for every situation, including options that fit in your sink, are easy to transport, and make bath time fun. Babies may be tiny and adorable, but they are capable of making huge messes. Whether you have an emergency spit-up situation, or it’s simply time to get clean, you’ll want to pick the best baby bath tub to help. Curious kids can make it tricky to keep them contained and safe during their scrub down, and slippery newborns present their own unique challenges. Fortunately, you can find a basin or insert that will make the process easier and more enjoyable for both babies and parents alike. In this guide, we’ve rounded up the best of the best for every situation. We’ll give you the details on each model, including how it works, what it costs, and what sets it apart from the competition. Then, we’ll provide a buying guide to help you decide which option is perfect for your child. If you’re looking for the best baby bath tub out there, chances are you already know that there are hundreds of different options. We’ve done the hard work for you to help narrow them down. We started by scouring the internet for the products that have top reviews from parents who use and love the model. Then, we eliminated anything that posed a safety hazard or had a recall that could impact its performance. Our list only includes contenders that are comfortable to use for both the little ones and their parents and have features that make bath time simple and fun. We’ve made a note of which tubs are best for different situations, making it easy to find options that fit specific criteria. For example, if you need one that sits in the sink versus a tub, or you’re looking for a design that’s easy to transport, we have you covered. If you are searching for an infant, or want something for your soon-to-be toddler, then check out the details to know if the model is age-appropriate. Here’s a round up of the best options for babies that fit every budget. We love a durable product that comes with features that allow it to grow with your child and the Sure Comfort Deluxe from manufacturer The First Years fits the bill perfectly. This one-piece model fits comfortably in most single or double sinks, but you can also use it in the bathtub. If you have a newborn, the removable sling will cradle your baby and keep them in a comfortable position so that they don’t accidentally slide around in the but. The hammock is made out of high-quality mesh that is machine washable, and the pads that support your infants head and body are mildew resistant. Once your baby is a little older and has better stability and head control, you can remove the mesh hammock and let them enjoy the padded headrest and ergonomic design during bath time. The tub can accommodate children who weigh unto 25 pounds, and once your little one starts to sit up on their own, you can flip it around and use the side with the straight back for additional support. This model is easy to drain thanks to a plug at its base, and it also has a built-in sensor that changes color if the water temperature is too hot to help keep your baby safe. Parents love the durability and versatility of the Sure Comfort Deluxe, and they are particularly impressed at the price point. It retails for around $. Another favorite among parents, Eurobath made by Primo is a simple model that provides everything you need for a safe and fun bath time routine. This made in the USA option is passionate about their materials, and only uses plastics that don’t contain hazardous chemicals like BPA or Phthalates. The basin is also recyclable, which is a perk if you are environmentally conscious. Constructed in one part from molded plastic, this option is simple to clean and maintain, and it doesn’t have any potentially hazardous moving pieces or sharp edges. This is one of the larger tubs on our list which means it can grow with your children. Measuring at 36-inches long, 9-inches deep, and 21-inches wide, it may be too large for some sinks but fits perfectly in a bathtub or stand-alone shower. Some parents noted that you'd want to get the tub in place before filling it with water as it can be heavy and difficult to transport if you do it the other way around. Thanks to the molded design, there are two ways that your child can sit in the basin. Infants comfortably recline and use the stoppers to keep their body above the water while they’re getting washed. As they grow, your child can also sit upright and use the supportive backrest and stopper that goes between their legs for stability and to hold them safely in place. You can use this model all the way up until age 24 months, and it retails for around $. Newborn’s have different bath time needs than older babies, and those who are especially tiny might need a special tub to keep them comfortable and safe. The Angelcare Bath Support is an excellent choice for newborn infants because of its thoughtful construction. The gently inclined position ensures that their head will always stay stabilized and out of the water, and the soft-touch material protects your infant's delicate skin. Users rave about how easy it is to use and maintain, and the mildew-resistant material dries quickly which makes clean-up a breeze. It fits in a sink or the bathtub and is best for infants ages 0-6 months. 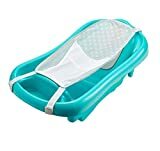 The Angelcare Bath Support retails for around $, but you can often find deals online and pick it up for as little as $ if you purchase on sale. Although large one-piece baby bath tubs are accessible and easy to use, they can be difficult to store if you have limited space. 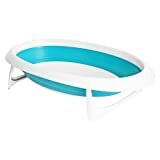 The Naked Collapsible Baby Bath Tub is an excellent option if you want a model that folds up and flattens out so that you can slide it out of the way. Unlike other collapsible models, this option from Naked is constructed out of one streamlined piece, so you don’t have to worry about keeping track of lots of parts or having to clean several accouterments after the bath. There are two support position options, and it can accommodate babies ranging from infants to 18 months old. Parents who used this tub love that it’s easy to collapse and expand, but some did caution that the material is a bit slippery when wet. You’ll need to keep an eye on younger infants or invest in a non-slip mat to line the tub and help keep them in place. This is the most expensive option on our list, and it retails for around $. Inflatable bath tubs are popular because they are extremely easy to store and transport, but they’re best for babies who are able to sit up independently. This model from White Hot is not only durable and functional, but it’s also adorable too. 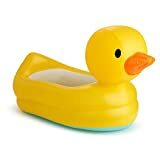 Parents love the rubber ducky design, and many say that their little one gets excited about their bath because of it. One stand-out feature that this inflatable tub has that others in its category don’t is a heat sensor. The temperature disc sits at the base of the container and changes color if the water is over 104 degrees. The padded headrest is comfortable, and some users report that this inflatable option can double as a playpen if needed. The manufacturer recommends you use this on babies between six and 24 months old. It comes in duck or swan shapes and retails for around $. If you’re still trying to narrow down your choices, here are a few additional factors that can help you determine the best baby bath tub for your needs. Do I Really Need a Baby Bathtub? Once commonly asked question is whether or not a tub for your infant is necessary. Although some parents prefer to use the kitchen sink, most prefer the safety and functionality of another option. Baby bath tubs will help to stabilize your newborn, and they can also make it much easier on new moms. Because they are easily set on a countertop, it eliminates the needs to bend over a wash basin to get the job done. There are many budget-friendly options, and they are a popular item that people love to gift for a baby shower. It’s worth it to buy one to make your life a bit easier after delivery. Our list of top picks includes options in several categories, but it’s important to understand the types of tubs and differences between them. Different models are best in different scenarios. For example, if you need an option that’s easy to transport, you might want to consider a collapsible or inflatable design. If you want to administer a bath from a countertop rather than in your bathroom, a basin tub could be the perfect fit. Consider your needs and situation before deciding which type of tub is best for you. Do I Want a Tub that Fits in my Sink? If the answer is yes, you’ll need to pay attention to the dimensions and choose a model that’s the right size. Most parents prefer this approach because it makes it easy to fill and drain the basin, and they don’t have to worry about trying to lift it when it’s full of water and heavy. How Do I Drain the Water? Like we mentioned above, full tubs can be heavy, and if they don’t have a simple drainage system, they can be messy to empty. Look for models that have a system that releases water from the bottom of the basin. This way, you’ll lighten the load and make it simple to empty, rinse, and try the tub when you’re done. Do I Want a Temperature Indicator? Not every product comes with a built-in temperature indicator, but many parents want the feature to ensure that they aren’t putting their child in water that is too hot or too cold. There are two main types. The sticker strip version is usually attached to the inside of the tub and blends into the plastic material. They will change color if the temperature is unsafe, but they are sometimes slow to react so you’ll need to give them a minute or two to adjust. Digital indicators are another option, and they will display an exact temperature reading on a display screen that’s attached to a thermometer in the water. Although these are more immediate and accurate, they are often more expensive. One final piece of advice when shopping for the perfect tub is to play close attention to how it’s built. Safety is important, and the best options will use high-quality materials that are unlikely to crack or break. One area of particular importance is the rim of the basin. You’ll want to ensure that it’s crafted with a smooth surface without any jagged edges or protrusions that could scrape your infant's skin when it’s damp and vulnerable. In addition, make sure the overhang is substantial. This is where you’ll grip the tub if you have to carry it, and also the piece that will support it when it’s placed in a sink. The material here should be thick and well-constructed so that you don’t have to worry about it breaking and causing an injury.